The near mature fruits of perennial deciduous arbor plant Prunus mume (Sieb.) Sieb. et Zucc. , of family Rosaceae. Zhejiang, Fujian, Yunnan provinces in China. Collected the near mature fruits in summer; baked in low temperature and braised to wizened and be black in color. Burnt smell, extremely sour and astringent. Large, rich pulp, smooth and moist, extremely sour. The pits removed, unprocessed or stir-baked to charcoal. Sour, astringent, neutral; liver, spleen, lung, and large intestine meridians entered. Astringe intestines to check diarrhea, astringe lung to check cough, quiet ascaris, promote the generation of fluid. It is a common used herb for chronic diarrhea and dysentery, because it enters large intestine meridian and astringes intestines to check diarrhea and dysentery. It could be decocted singly or combined with other intestines-astringing herbs to enhance the action of checking diarrhea or dysentery. This herb is sour and astringent in nature without astringing pathogen. For diarrhea and dysentery of damp-heat type, bloody purulent stool, it is combined with heat-clearing and damp-drying herbs. For instance, it is used with Huang Lian, Huang Bai in the formula Wu Mei Wan from Sheng Hui Fang. It enters lung meridian and can astringe lung to check cough, so it is indicated for chronic cough with little phlegm or dry cough without phlegm caused by lung deficiency. For chronic cough, it could be decocted into plaster singly or combined with other lung astringents to enhance the action of checking cough. It is a good herb for quieting ascaris and can quiet ascaris to check pain. For abdominal pain, vomiting, cold limbs caused by ascaris, it is combined with vermifugal herbs. For instance, it is used with Xi Xin, Hua Jiao, Huang Lian and Fu Zi in the formula Wu Mei Wan from Shang Han Lun. It can promote the generation of fluid to relieve thirst. For diabetes due to deficiency heat, it is combined with yin and qi tonics. For instance, it is used with Tian Hua Fen, Mai Dong, and Ren Shen in the formula Yu Quan Wan from Shen Shi Zun Sheng Shu (Shen's Treatment Book). 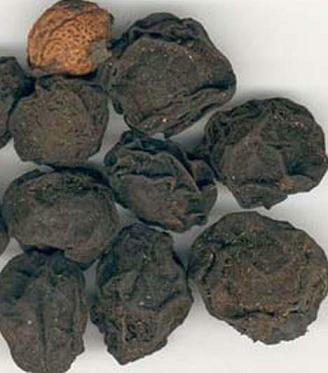 Besides, it can be used for metrorrhagia, metrostaxis, hematochezia and hematuria, if stir-baked to charcoal. Decoct 3~10 g, even to 30 g. Appropriate dosage for external use, pounded to pieces or stir-baked to charcoal. And for stopping bleeding, the one stir-baked to charcoal is best.